One early theatrical reference is to a production at Arch Gifford's Tavern at Broad and Market streets. And it is known that Capt. Jabez Parkhurst opened the South School, or Literary Institution in Lincoln Park with a presentation of 'Gripis' in the latter part of the 18th century. During most of the 19th century, four large halls, Washington, Mechanic, Military, and Library, were used for all types of 'sedate musical and literary presentations.' Not until 1847, however, was, the first real theater built in Newark at the corner of Market and Halsey streets. For many people who lived through the Great Depression and the busy years of World War II, the movies became a best Friday and/or Saturday night friend. Some of Newark's theaters live on in their memories. These included the Branford, the city's largest and most elegant house which seated 3,100. Built in 1941 by Emil Zucker and Herman Steiner, it was named for one of the Connecticut towns that original Newarkers came from in 1666. 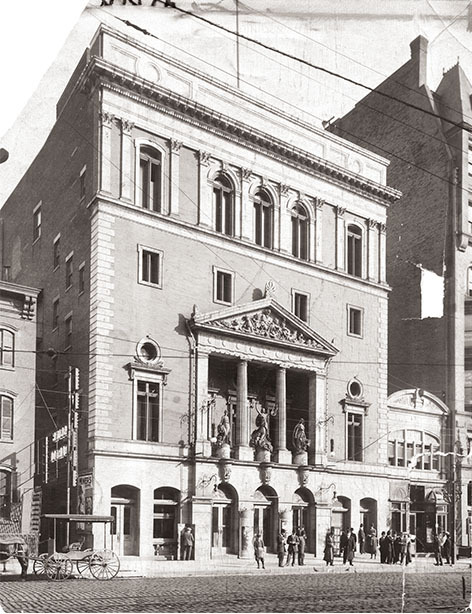 Other great structures include: Loew's State, 2,700 seats; Proctor's Palace, 2,500 seats; Kenney's, 2,100 seats; Terminal, 1,800 seats; Orpheum, 1,693 seats; Miner's Empire, 1,605 seats; Newark, 1,589 seats; Lyric, 1,466 seats; Broad, 1,460 seats; Proctor's Roof, 1,450 seats; Brand, 1,250 seats; Paramount, 1,200 seats; Court, 800 seats; Goodwin, 761 seats. In addition to these downtown houses, Newark's neighborhoods were dotted with unusually fine movie houses which drew local neighborhood crowds. Yet all did not remain perfect in movieland. Signs of decline were generally marked in the late 1940s and 1950s with the advent of television, changing city neighborhoods, the flight to the suburbs, and an increasing ease of movement. Newark's last two movie houses, the Paramount and the Adams went dark in 1986 when their insurance rates increased 500 percent. Newarkers seeking mainstream popular movies had to go elsewhere. Until recently, the era of the movies seemed dead, but is it? The 1990s saw the opening of two new theater complexes in Newark; one at the old airport drive-in and the other at Springfield Avenue and Bergen Street. Again, Newark has become one of the area's biggest, brightest, and best-run movie centers. Once more, there is a special corner of the city where a dozen curtains rise on those Hollywood fantasies. The city that contributed to the development and nourishment of the American film industry again is going to the movies first class!